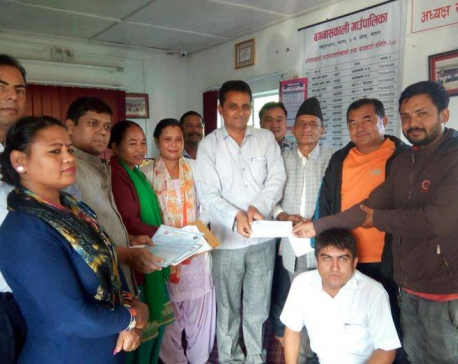 KATHMANDU, Aug 4: An independent group of youths from Dolpa district has vented their ire against the plan of the ruling Nepal Communist Party (NCP) to field senior leader Bam Dev Gautam in a re-poll after forcing the elected lawmaker from the district Dhan Bahadur Budha to resign. Organizing a press conference in the capital on Friday, the independent youth group said they will take all possible measures to defeat Gautam if the rumor they heard was true. “We are disappointed to learn that a conspiracy is being hatched to elect Gautam from Dolpa through an unnatural manner. We will protest appropriately if what we are hearing now comes true,” said a youth from Dolpa, Prem Bohora. Organizing a press conference in the capital on Friday, the youths argued that since the people of Dolpa have elected Budha for a term of five years, the ruling party should not exert any pressure on him to resign. Any such move from the top leaders of the ruling parties not only goes against the spirit of the constitution, but also makes misuse of a huge amount of money in the name of by-election from the state coffers. Budha, who received over 77 percent of the total votes cast in the recently held parliamentary election, is currently serving as State Minister for Tourism, Culture and Civil Aviation. “We youths from Dolpa appeal to Budha not to resign from the post. Nobody should consider the people from Dolpa as voters of their pockets,” said Chandra Budha. Another youth Jeewan Shahi expressed concern over the attempt of making Dolpa a place of political experiment. “The main objective of the press conference today is to raise the voice of the youths of Dolpa. We want to warn all those hatching a conspiracy to elect Gautam unnaturally from Dolpa district,” he said. A large number of Dolpa youths currently living in Kathmandu were present during the conference. They argued that someone, who has never lived in Dolpa or understood Dolpa properly, cannot truly represent the people of Dolpa.